Last weekend, I had a day off and was able to participate in Smithsonian Magazine's Museum Day Live!, a national event in which museums across the country provide free admission to various sites and museums. It's a celebration of the no-cost nature of Smithsonian museums, and being a frugal and frequent museum-nerd, I immediately signed up for my free ticket to The Morgan Library. Featuring a collection of rare books, manuscripts, letters and correspondance, the Morgan Library was once the personal library of J. Pierpont Morgan, New York's industrious banker of the early 20th century. The architecture and design of the library is beautiful, and more than a few times I had to stop myself from breaking out into half the songs from Beauty and the Beast. But enough about the library. I had some time to kill after the museum and needed a snack. I found myself near Grand Central Station and wandered in. There's something about the hustle and bustle of train stations that excites me to no end, and Grand Central's stunning beaux arts architecture seemed to be the perfect compliment to my artsy Saturday. With thoughts and hopes of a slice of pie, I walked down to the food court - and to my delight, discovered that Magnolia Bakery has a counter selling their sweets to weary travelers. I know what you're thinking. Magnolia Bakery? The cupcake place? But Mary, this is a PIE blog - you don't even like cupcakes!! And you're right. This is a pie blog, and I don't like cupcakes (sorry). BUT Magnolia serves goodies other than their famous cupcakes, and I had been itching to try their pie for some time now but had always been turned off by the long lines of pastelled women who believe that one cupcake will turn them into Carrie Bradshaw. 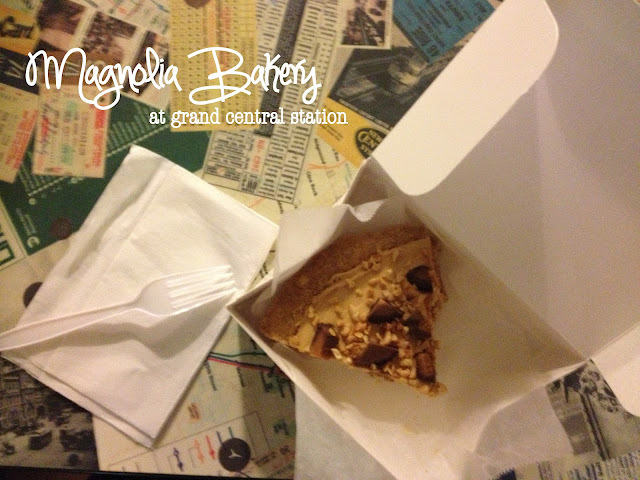 Luckily, there wasn't a line at all at the Magnolia at the train station and I was able to order a slice of Peanut Butter Icebox Pie. It was a HUGE slice of pie. And it was good. Not great, but good. The whipped cream/cream cheese filling was indeed smooth and creamy, but too much. After a few bites, I wanted more taste variation, and the filling-to-topping ratio left me needing less creamy and more crunchy nuts and Reese's. Same with the crust - it was decent, but way too thick to be your average wafer-graham cracker crust. A dash or three of nutmeg would have gone a long way. Most disappointingly, the pie was not cold enough. When I order a slice of ice box pie, I expect it to be freezing. Like ice. 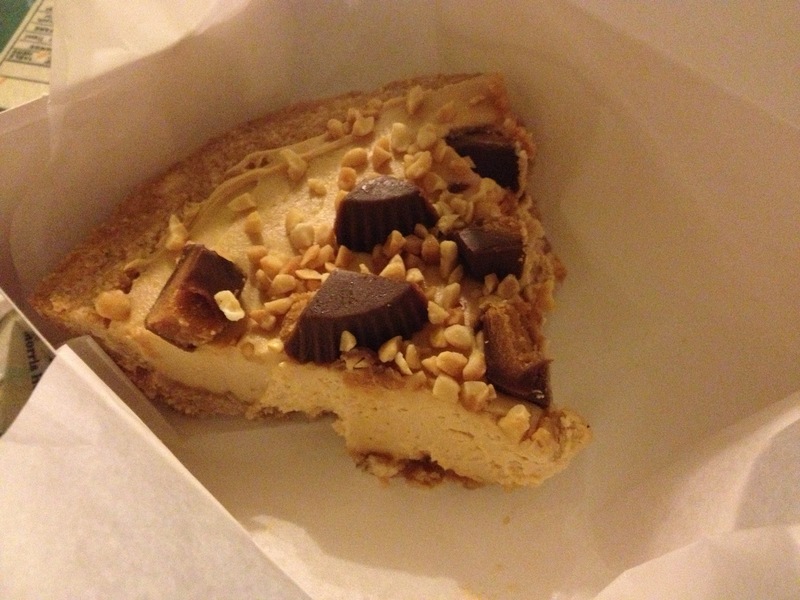 I ended up not finishing my slice (although I made quite sure to eat all the Reese's bits). I suppose the real draw of Magnolia is the cupcakes. Or it's the sociological phenomenon that a popular style or trend will become more popular simply because it's thought to be popular. Whatever it is, I'm glad I finally got around to trying something from Magnolia, but I think I'll continue to see what the rest of the city has to offer.